Now there is a reason to start calling Hawaii the Jeju of America. 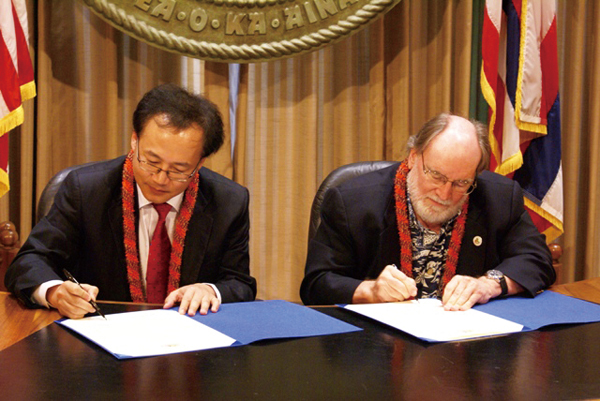 On Feb. 3, in Honolulu, Hawaii, State Governor Neil Abercrombie and the director of the Electricity Market and Smart Grid Division at the Korea Ministry of Knowledge Economy Choi Kyu-Chong signed a letter of intent with the purpose of sharing information about Smart Grid technologies. Korea has been a leader in Smart Grid technology and has been operating a Smart Grid test bed since 2009 on the northeast side of Jeju Island in Gujwa-eup, Jeju City. Currently in its second phase, the Jeju Smart Grid has been installed in 6,000 homes in Gujwa-eup and is being expanded to Jeju City. According to the Korea Smart Grid Web site, the Jeju Smart Grid will be completed by 2013 and then exported to other countries as well as begin nationwide expansion. Korea has set the goal to implement a nationwide Smart Grid by 2030. Over 170 companies are involved in the project. The Smart Grid is a intuitive infrastructure that gives the consumer more control over the energy they use through real-time communication with energy supplies. The grid informs the consumer when it is cheapest to use energy and how much energy is being consumed among other pertinent information. Houses connected to the grid are also supplied with solar panels and other energy-generating devices that the consumer gains energy from. Energy the solar panels generate that the consumer does not use is then sold to the power company. The aim of the letter of intent is to sign a memorandum of understanding similar to what Korea established in July, 2010, with the state of Illinois who plan to install next-generation energy-saving devices in at least four buildings in Chicago with investments by LG Electronics, KT Corporation, and others at more than US$ 35 million. The letter of intent also establishes that both parties will work together on Smart Grid research and share best practices for further implementation of a Smart Grid infrastructure. This project is part of the Hawaii Clean Energy Initiative which, according to its Web site, is the state with the highest dependency on oil and plans to achieve 70 percent clean energy with 40 percent being renewable energy by 2030. Hawaii hopes that this will save the state some of the money spent on importing oil, which currently sits at US$ 4 billion. The letter of intent states that the memorandum of understanding is set to be signed on Oct. 31, 2012, which will go into greater detail of each parties responsibilities, the size of the project, and the companies involved.